The boat trip takes approximately 15 minutes each way and the tour of the island and the lighthouse is approximately 1 hour. We ask you to meet your guide at the pontoon on the pier. Your guide will give a safety briefing before boarding our passenger boat. 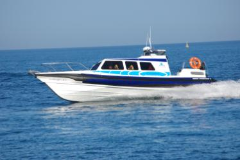 Our tour boats carry a skipper, a guide and 10 – 12 visitors. Multiply trips can be organised for larger parties. 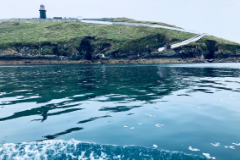 Ballycotton Lighthouse Island is a wild, natural and unspoiled experience and due to the island’s rustic nature the tour requires a certain degree of agility and love of adventure. We regret that the tour is not suitable for wheelchairs, pushchairs, pets and children under 1. In the event of adverse weather conditions preventing us from docking at the lighthouse island we will provide a guided boat tour to the island however, we reserve the right to cancel sailings if necessary. 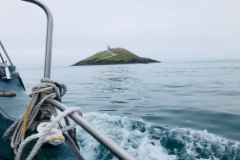 Our mission is that everyone leaves Ballycotton Island having had a unique, magical and enjoyable excursion. Safety is paramount to this positive visitor experience. We are afraid this trip is not suitable for children under 1 years of age. Check-in is 15 minutes prior to departure. Please plan your visit accordingly. Visitors are asked to please keep within the boundary walks and fencing whilst on the island and we advise visitors to wear warm clothes and sensible shoes. Reservations are advisable. All bookings are subject to our terms and conditions. Please read our terms & conditions carefully. Open 7 days per week, seasonally and subject to weather and availability. Meeting point is at the BallycottonSea Adventures kiosk on the pier. Visitors are advised to arrive 15 minutes prior to scheduled departure. 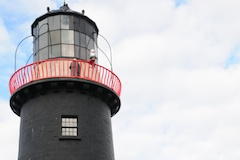 Don’t forget your camera… views from the Lighthouse lantern balcony are breathtaking but please leave nothing but your footprint on the island and take nothing but photographs!